Click on either the site name in the diagram above or the links in the menu for details of official local sites. The sites listed in this sites guide are the only sites that the Kernow Hang Gliding and Paragliding Association has negotiated permission to fly. 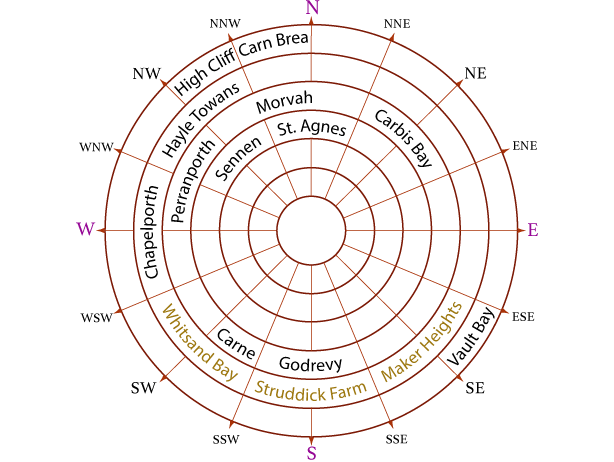 Please note that Maker Heights, Struddick Farm and Whitsand Bay (Freathy), are managed by the South Devon Hang Gliding and Paragliding club. Don’t forget Military Freephone for midweek flying: 0800 51 55 44. The KHPA has agreed to use frequency 143.750MHz as the standard frequency for all club flying and all radio users are requested to use this channel when flying club sites to enhance safety and awareness. Please note that it is the responsibility of the radio user to ensure that they comply with the law regarding the use of radios as detailed in the BHPA Pilot Handbook, Chapter 23, Page 222. Please go to the Visiting Pilots page. Visitors should give the Club Contact a ring before flying at our sites. Some sites are restricted to Resident Kernow Hang Gliding & Paragliding Association Members, usually on the insistence of the Site Owner. In such cases we seek to arrange for visiting pilots to fly these sites as Accompanied Visitors. Visiting pilots are asked to respect this arrangement. The sites affected are all sensitive sites and unauthorised use may well result in loss of the site altogether. This applies equally to members of neighbouring Clubs (South Devon HG&PG Club and The Devon and Somerset Condors}. In other words, paying a subscription to KHPA does not open the site to non-resident pilots. Circumstances and arrangements relating to sites are often changing. Every effort will be made to keep the guide up to date. KHPA members and visiting pilots can assist by reporting any problems, changes, errors or suggestions for improvement, to the Club Contact. Association members will be kept informed by notices at the monthly club meetings, the monthly KHPA Bulletin, on this web site, and by e-mail. These aircraft must not be operated from the Association’s sites without special and specific permission from the Site Officer. Pilots flying these aircraft from other sites are requested not to overfly Association sites. All accidents and incidents occurring on an Association site should be communicated to a Club Contact as soon as possible. Alternatively you can send a report of your incident directly to the Chairman using our Incident Report Form that can be found here. Please notify the Site Warden or any other KHPA Committee member (listed on the Contact page) of any errors or omissions to our site guides.